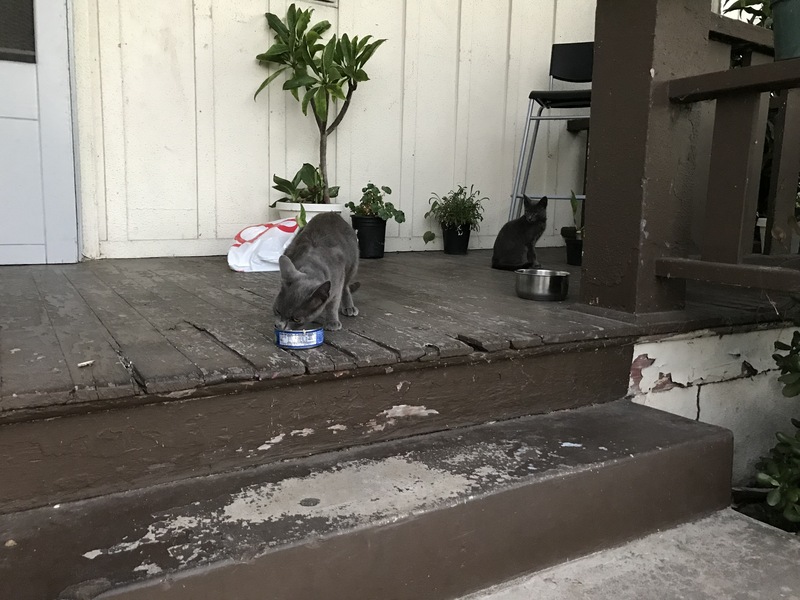 The drama of the three feral kittens opened a new—and perhaps final—neighborhood chapter last evening. I don’t yet know how the story ends. Around 7:20 p.m. PDT, with the protection of the waning light, I went out for a walk. Hours earlier, I had been at the ophthalmologist’s office, where one eye was dilated, leaving my vision temporarily impaired and sensitive to the San Diego sun. My walk ended abruptly. A small group of teens, from two families, were gathered around the house where I had seen the feral trio the previous evening. Armed with cans of tuna, tenacity, and patience, they determined to trap the beasties—and one other: their momma. 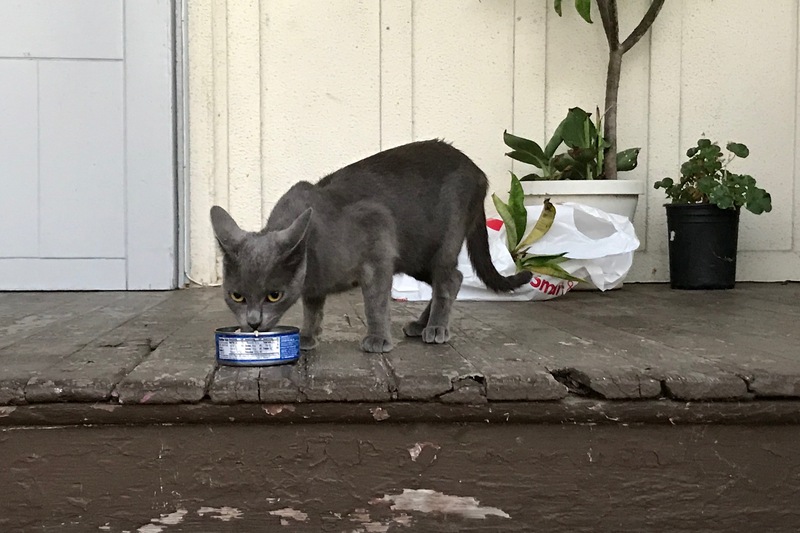 I started this series in October 2016, to date featuring more than 80 felines, and until last night I had not seen her. That’s surprising, since she raised her brood about a block from our apartment. 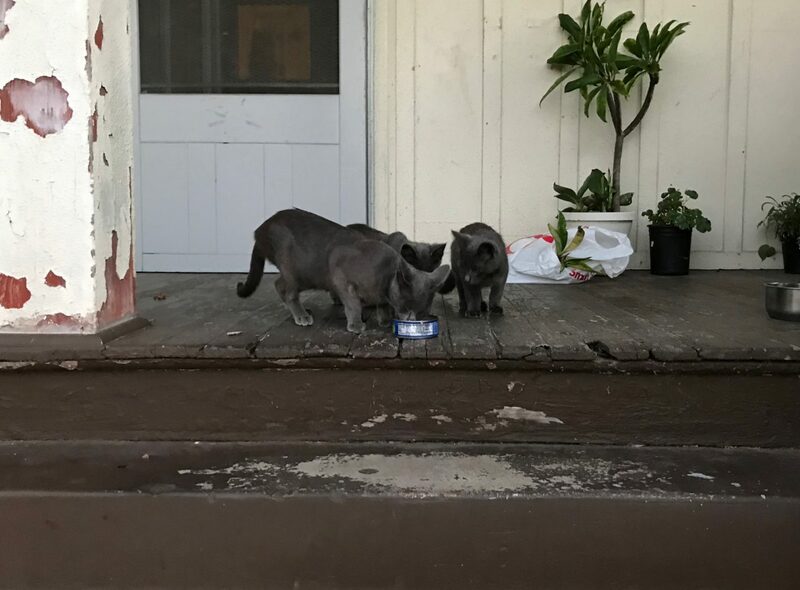 Based on information from the neighbor whose porch were the cats: Momma birthed and nursed her litter under a house nearby the American Market, which is at the corner of Cleveland and Meade. Renovation of the property, and construction of an adjacent condominium, compelled her to move the four kittens. Apparently, there were at one time two each of blacks and greys. One of the darker youngsters later disappeared, hopefully into a loving home. Earlier in the day, someone from the local animal shelter had dropped by three traps, having previously discussed the animals’ situation with the residents. But the kids didn’t know that, initially. When I arrived, they had calmed momma and coaxed her with tuna, while the little ones stayed back. Briefly that changed—the moment I captured using iPhone 7 Plus. With only one good eye, and darkness dropping, I must have mistakenly activated the digital zoom, not the optical. She is large and pixelated in the Featured Image. Vitals: f/1.8, ISO 100, 1/12 sec, 3.99mm. In the second portrait, one of the two greys enviously watches momma eat. Vitals are the same. The water dish isn’t for the ferals, BTW. The people living in the residence own three dogs. The final photo is the breakthrough, where some of the family chows together. The black kitten was most skittish of all, remaining offish despite the tempting tuna. Vitals are same as the other except for shutter speed: 1/13 sec. Shooting time was around 7:40 p.m. for all three. The teens had planned to lure the cat family into cardboard boxes and then take them home for the night. But the traps changed the character of their endeavor and likelihood of success. The animals’ destination was always the animal shelter; just the means changed. I was pretty much a useless observer, because of my temporarily impaired eyesight. But I did meet some new neighbors—three of them adults—all living about a block from our apartment going in two different directions. When I left the summer teen cat adventure, long past sunset, the trapping had only just begun. The kids had the right priority: nab the kittens, then their momma. If, or when, I get more information, this post will be amended. Also in this series: Scruffy, Roly Poly, Woo, Skull, Biscuit, The Colonel, White, Chipper, Frisky, Stretch, Needy, Farfisa, Mates, Hunter, Pee-Pee, Blue, Blue Too, Bonded Pair, Patience, Fess, Jumper, Frenemy, Looker, Cozy, Scout, Lurks, Skit, Mini, Betty, Black and White, Stalker, Bell, Chill, Sammy, Scratch, Poser, Star, Grey and White, Watcher, Herman, Comet, Roman, Willow, Chub, Nimbus, Watson, Lilo, Kit, Pepe, Twilight, Sebastian, Spot, Booger, Ash, Veruca, Riley, Mellow, Bonde, Flower, Glass, Black, BeBe, Fang, Bruce, Siamese, Pounce, Tortie, Haiku, Fraidy, Peso, Daniel Tiger, Dusk, Stride, Dainty, Spry, Tabby, Betty Too, Still, Levi, Shadow, Sophie, Wink, and Ferals.